Halloween is right around the corner! And for us, part of the fun of Halloween (or any holiday really) is making fun themed food! At Halloween, anything orange and black tends to be popular! And so, during this time of year, there is a perfect drink to help with that – TruMoo Orange Scream Milk! 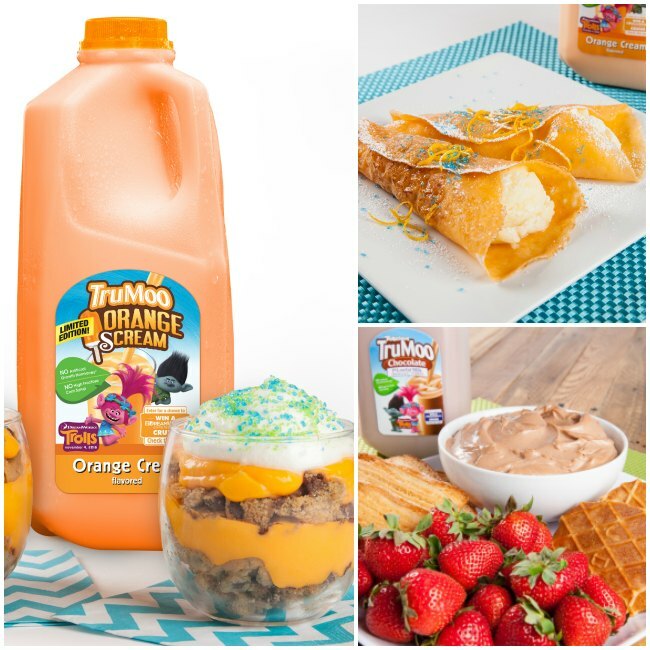 So, I was thrilled to partner with sponsor TruMoo to bring you some fun Orange Scream recipes (and a chance to win some super fun prizes, like a cruise)! TruMoo Limited Edition Orange Scream milk is perfect for Halloween. It’s inspired by the classic orange frozen popsicle with vanilla ice cream. YUM! That means it’s delicious AND nutritious because it is made with wholesome low-fat white milk, no high fructose corn syrup and no artificial growth hormones. You can find TruMoo Limited Edition Orange Scream nationwide in the dairy case at grocery stores through the end of October 2016. So pick up a container and make some of these fun Orange Scream recipes! 15+ Frightfully Fabulous Orange Scream Halloween Treats! Aren’t those all so fun?! Kids will love all these orange treats! And this fall, TruMoo Orange Scream gets even more fun with a “Trollicious” makeover! 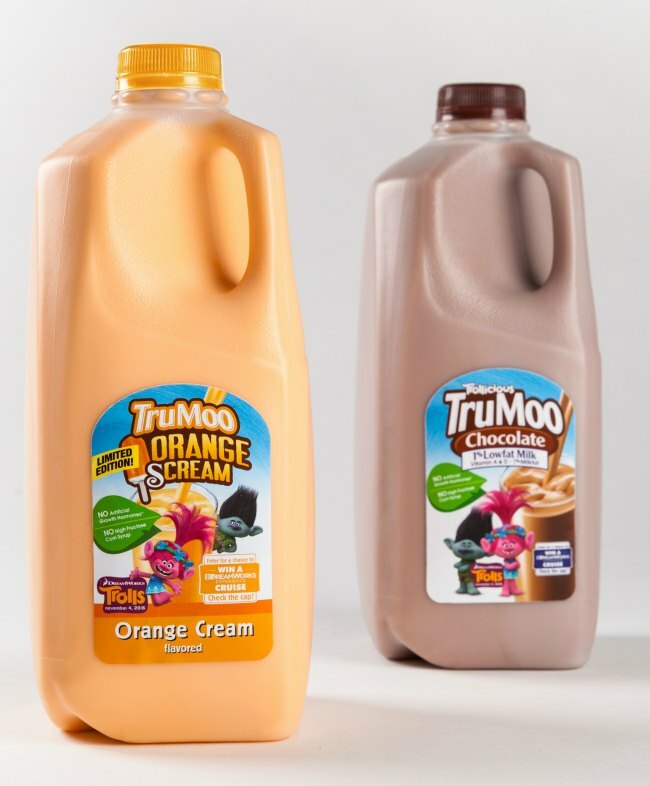 From now through October 31, 2016, Poppy and Branch, the colorful and spunky characters from DreamWorks Animation’s new comedy adventure, Trolls, will be making an appearance on specially marked bottles of limited-edition TruMoo Orange Scream milk and TruMoo Chocolate milk. The movie looks so fun – it’s definitely going to be a hit with the kids! So, if you and your family are looking to whip up Trolls­-inspired treats for the premiere, these TruMoo Chocolate and Orange Scream milks are a great option! Whether served in a glass or incorporated in creative recipes like Poppy’s Orange Scream Pudding Parfaits, “Trollicious” Chocolate Cheesecake Dip or the Truly Colorful Crepes, your little trolls are sure to love them! So, it’s clear that TruMoo Orange Scream is the perfect treat for your Halloween festivities! But there’s more– TruMoo is also giving you a chance to win a Royal Caribbean DreamWorks Experience cruise, plus week Trolls prizes! Visit TruMoo.com to enter the codes found on specially-marked bottles of TruMoo Chocolate and Orange Scream milks to enter for a chance to win. * Good luck & have a screamtastic Halloween!!! Disclosure: This post is part of a sponsored campaign with TruMoo.